Corallium (shown) ~ "…there is Perseus, unchaining Andromeda, naked from her tidal rock, and laying Medusa’s head upon the ground, blood spurting from her severed neck, staining the water of the sea, from which grew coral. [...] It is from nature, and in particular from the resources of the Mediterranean, that Corallium gains all its fascination, producing a perfume of rare intensity and sensuality, perfect to gratify the most demanding connoisseurs." Featuring notes of bay, myrrh, mandarin, bergamot, patchouli, cedar, sage, musk and tree sedum. Carthusia 1681 ~ "In 1681, once the reconstruction of the Charterhouse was complete, the monks of Capri began to prepare the first perfume essences based on local herbs and spices. Since then, even though much has changed, the fine craft care and rigorous observance of natural methods have remained substantially the same. Carthusia means Charterhouse and Carthusia Perfumes are still prepared with the fragrances and aromas that the island continues to produce. These unique values are brought together in 1681, the rich new essence in which a thousand different intensities converge into a sensation of refined complexity." The notes include mandarin, bergamot, coriander, red thyme, rosemary, iris, neroli, lavender, petigrain, black pepper, sandalwood, cedar, incense, amber, vanilla and musk. Update: see a review of Carthusia 1681. Same. Now I tend to like Carthusia’s offerings, but I can’t even gauge what these are … I couldn’t get past the bit about Medusa’s severed head. Getting bad flashbacks to Clash of the Titans. Yep…but, since I”ve liked several previously, I’ll undoubtedly ignore the copy and try these. God, that movie haunted me as a child. It was the severed head and the flailing body, and by gum, I will probably never smell this without thinking of that. Interesting…this ad copy did not strike me as worse than the usual although the “blood spurting” was definitely over the top for a perfume. Anyway, I like Carthusia — I’ll try them too! It made me laugh. I had to take a moment to even process what I was reading when I saw the name ‘Perseus’. Spent too many years studying Classics, but all I could think of was that awful CotT remake. But I do so love Carthusia so I will be sorely tempted to sniff these. I don’t know why in particular I reacted to these, but I could not read past “blood spurting from Medusa’s severed neck” and “the monks of Capri” without getting silly. It’s probably because I study history, the classics, mythology, etc. that these just tickled my funny bone. The ad copy may be mighty silly, but my Greek mythology obsessed inner six year old is squealing in glee! You & I both, dear. I salute you for having spent years studying the classics, K! You are living the inner six year old’s dream Let’s hope it lives up to all that exciting talk… the notes certainly sound interesting. I admittedly never grew out of my childhood dream of wanting to be a female Indiana Jones which left me studying an array of topics over the years. The sad truth is I can’t -do- anything with it. It does influence a lot of the fragrances I like/wear, though. Oh no!!! And what a shame, as NOTHING is cooler than a female Indiana Jones. Harrison Ford is just my dream man, I still can’t decide whether I prefer him as Han Solo or Jonesy. But with your Indiana Jones skills, surely there’s a job at the Osmothèque with your name on it? Oh were that the case. History, museums -and- perfume. I think I would be in heaven. Totally! As soon as I read the ad copy, I was picturing “Clash of the Titans” (the original, not the current one, because that’s how old I am). I grew up with the original one. I dunno what I went and saw a few weekends ago but it was not the Titans I remember. I feel this was the common sentiment among readers at the ad copy. Hilarious. I’m waiting for that one! The notes in 1681 sound sufficiently intriguing to me to forgive the mixed metaphorical references in the copy for Corallium….I haven’t tried any scents in this line but might have to put down my red pen long enough to get some samples! … what everyone else said. I thought, it’s too late for Robin’s contest! Mostly, though, I see “Carthusia” and wonder whether Mediterraneo’s still any good. All that citrus … do you think it just smells like lemon Pledge now? Lysol, according to my teenager. Of course, we’ve never smelled the pre-reform version, but to both our noses, it was Lysol. But wait, had you smelled it before? I mean, maybe you would have always found it so? I hadn’t, and that is definitely possible, although I haven’t had that issue with other lemon frags previously. On the other hand, my daughter didn’t hesitate a second before pronouncing it Lysol, so… Nothing for it but to have someone familiar w/the vintage give the reform a sniff! Still, these sound really interesting to me. 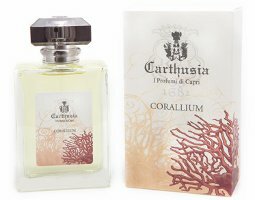 I have yet to try a SINGLE Carthusia fragrance, can you believe?! I don’t think I have tried any Carthusias, but I might have to start. The ad copy + all y’all’s comments have given me a pretty great laugh. What a great read on a dreary morning! I have to agree with March – it definitely would have been a contender for the Prix aux Faux. Hey, I just noticed all of those words end in “x.” cool! Or did I spell it wrong? I have sniffed the Carthusia line in the past, but they never made much of an impression on me, neither good nor bad, except for Uomo. That one, I remember as being particularly nice. Learned something today for the “useful facts for the next trivia game” file, which is always fun. Now I know how coral was created. This goes right up there with the little tidbits on the Snapple bottles. Purchased Corallium and loved it before I read the PR story. I love the woodsy quality and can’t find anything about it to remind me of severed heads or blood. Ignore the ridiculous hype and enjoy this lovely fragrance. Like the other Carthusia offerings it is suble which is a quality I really enjoy.